Like most nations America likes to celebrate its first's. Strangely enough this didn't seem to apply to the first jet bomber in USAF service, the North American B-45 Tornado. Although the airframe layout bore some resemblance to WW2 aircraft this new boy on the block had many aerodynamic refinements commensurate with the newly emerging jet engines. 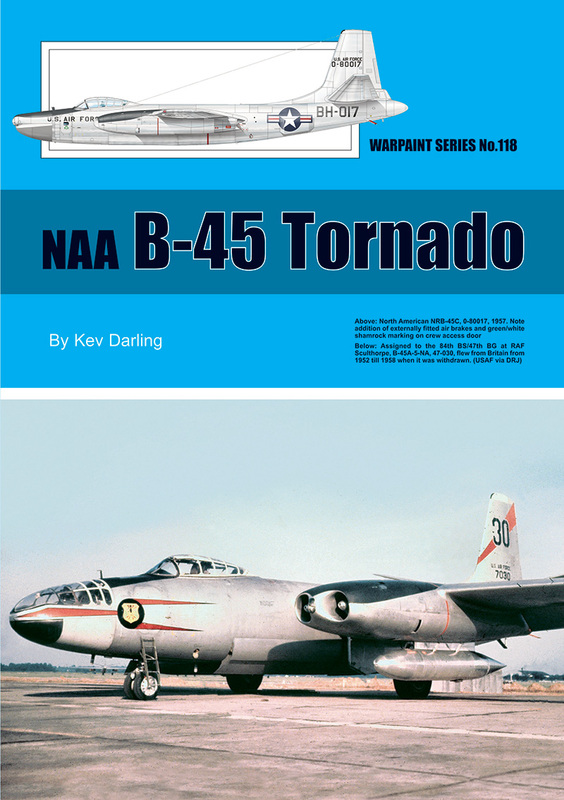 In common with many new designs the B-45 underwent many changes throughout its career, the greatest of which was the provision of more powerful and reliable engines. Major structural changes were applied to the principle bomber version to allow carriage of a nuclear weapon whilst the final model was a versatile reconnaissance aircraft, the RB-45C. During the Korean War the RB-45C carried out valuable reconnaissance flights in support of operations whilst in Europe the B-45C remained on alert for a possible war. Under the aegis of USAF the Royal Air Force flew a handful of aircraft to plot bomber approach tracks for both Bomber Command and USAF over the Soviet Bloc. When finally withdrawn from service the majority of B-45's were scrapped thus the surviving handful are drawn from those used as test beds. This book is written by Kev Darling and is superbly illustrated by Richard J. Caruana.